This asymmetric design with Egalitarian purple text compliments the flowers which surrounds it. 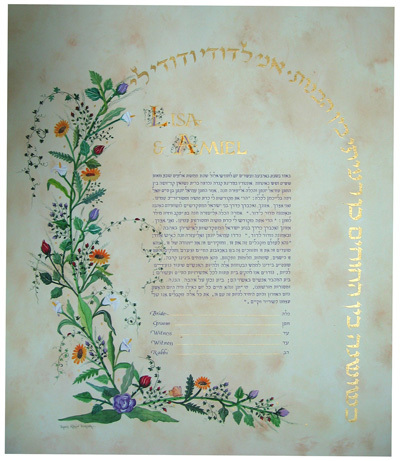 The design includes purple Roses and Rose buds, Sunflowers, Calla Lily and a tiny butterfly nesting on the vine on one side, verses from "song of songs" on the "parchment" background on the other side. On top are the names of the Bride and Groom illuminated with delicate flowers.